New Wave rock group from Boston, Massachusetts. Formed in 1976, they released their first single and LP two years later. Initially a guitar-driven rock act with some progressive keyboard accompaniment, after their first album they rapidly moved toward a heavily synth-based, pop-rock sound, then disbanded in 1988. 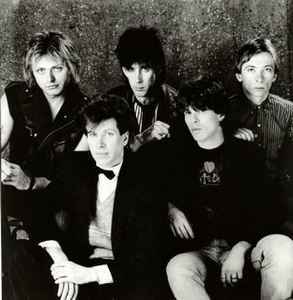 Line-up: Ric Ocasek (vocals, guitar), Benjamin Orr (real name: Benjamin Orzechowski - vocals, bass), Elliot Easton (guitar), Greg Hawkes (keyboards, sax) and David Robinson (drums). Blondie may have had a string of number one hits and Talking Heads may have won the hearts of the critics, but The Cars were the most successful American New Wave band to emerge in the late 1970's. With their sleek, mechanical pop/rock, the band racked up a string of platinum albums and Top 40 singles that made them one of the most popular American Rock N Roll bands of the late 1970's and early 1980's. In 2006, Greg Hawkes and Elliot Easton, together with Todd Rundgren and Kasim Sulton (both of Utopia) and Prairie Prince (formerly of The Tubes) formed The New Cars and played mainly original Cars material live. In 2011 The Cars (without Benjamin Orr who had passed away in 2000) released a new album and went on tour again with Greg Hawkes taking over on bass and Ric Ocasek as sole lead singer. Inducted into the Rock and Roll Hall of Fame in 2018.